Want to sharpen your talents? Talent expert Daniel Coyle has some good things to say. Year to year, there is no shortage in the number of books churned out in the self-help, motivational industry. 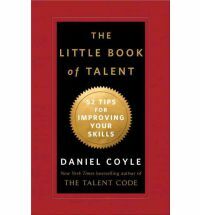 I’d like to think Daniel Coyle’s The Little Book of Talent: 52 Trips for Improving Your Skills (Bantam, 2012) stands tall among this crowd. His “little book” (its compact size is part of what influenced me to pick it up in the first place) is a pithy yet masterly distillation of five years of study of some of the world’s “talent hotbeds” and countless interviews with master coaches in art, music, sports, and business. Even better, the tips are based upon solid brain science, making this neat little book of tips far more concrete (and fascinating) than your typical, over-inflated, “believe in yourself!” fare. Below I’ve posted what I found to be the most fresh and helpful tips, excerpted straight from the book and organized according to its three parts. – Steal without apology: focus on specifics, not general impressions. – Choose Spartan over luxurious: simple, humble spaces help us to practice more deeply; luxury is a motivational narcotic. – To build hard skills, work like a carpenter: be precise and measured, and go slowly, fixing mistakes early in the process. – Honor the hard skills. Learning the fundamentals is the key moment investment. The most talented make deep practice central, the “big game” – they have a very different relationship to practice from the rest of us. – Find the sweet spot (this is key to building talent). Sensations: frustration, difficulty, alertness to errors. Percentage of successful attempts: 50-80 percent. Ask yourself: “If you tried with all your might, what could you almost do?” Mark this boundary. This is your sweet spot. – Take off your watch: measure your progress not in minutes, but in the quality of your practice, the number of reaches and reps.
– Choose 5 minutes a day over an hour a week. – Don’t do “drills.” Instead, play small, addictive games. If it can be counted, it can be turned into a game. – Pay attention immediately after you make a mistake. Make the correct move again. – Use the 3 X 10 technique: to learn something effectively, practice 3 times, with 10 minute breaks between each rep.
– To choose the best practice method, use R.E.P.S. – In learning or studying, stop before you’re exhausted. – Just before sleep, watch a mental movie. Use the first seconds to connect on an emotional level. Avoid giving long speeches – instead, deliver vivid chunks of info: give useful information that will push the individual to make the right reach. Be allergic to mushy, imprecise language. Give concrete suggestions that will combine into a concrete goal; communicate with precise nouns and numbers and avoid adjectives and adverbs. Make a scorecard for learning (“you are what you count”). Aim to create independent learners. Whenever possible, step away and create moments of independence. – Practice 5 hours for every hour of competition. – Focus on building new habits rather than breaking old ones (it is easier for your brain to build than to unbuild). – Give a new skill 8 weeks. (Don’t give up too early: building new circuitry takes time, and resilience is vital in the early stages). – Cultivate grit. Simple grit (“that mix of passion, perseverance and self-discipline”) is often a better predictor of success than other criteria such as IQ, GPA, and psychological test results. – Keep your big goals to yourself. Telling others creates an unconscious payoff, tricking our brains into thinking we’ve already accomplished our goals. – Think like a gardener, work like a carpenter: think patiently, without judgment. Work steadily and strategically, building your skill through daily deep practice. There it is, people. Now get motivated, go hard and sharpen those skills!